A few years ago, “shadow” games were all the rage. Games like Limbo introduced a cool new perspective and showed that games can be amazingly good even if they are graphically simplistic. A couple of years later, a new spin on this minimalistic gameplay was announced. Compulsion Games was developing a progressive new game where the player could shift in and out of shadows, giving the player an open-world experience in the three dimensional world while creating a classic platforming environment when you enter the shadows and use objects in the real world and the lights placed around you to allow you to reach new areas. 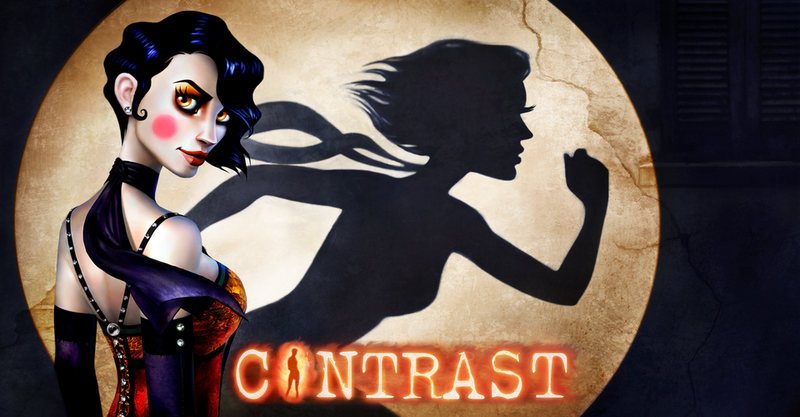 The game was titled Contrast. What made the game even more appealing was that it was set in a cool vaudevillian noir-style 1920s filled with cool atmosphere and an amazing soundtrack. Vintage-style singer Laura Ellis gave one of her songs to be used in the teaser trailer, and the positive reaction from gamers was so overwhelming that Compulsion brought on Ellis to sing for the game itself. In all, she recorded two tracks specifically for the game’s soundtrack, Kat’s Song and House on Fire. Turns out, her voice is so sultry that YouTube auto-set it as being NSFW and won’t let us change it…even though there is nothing NSFW about the above video. 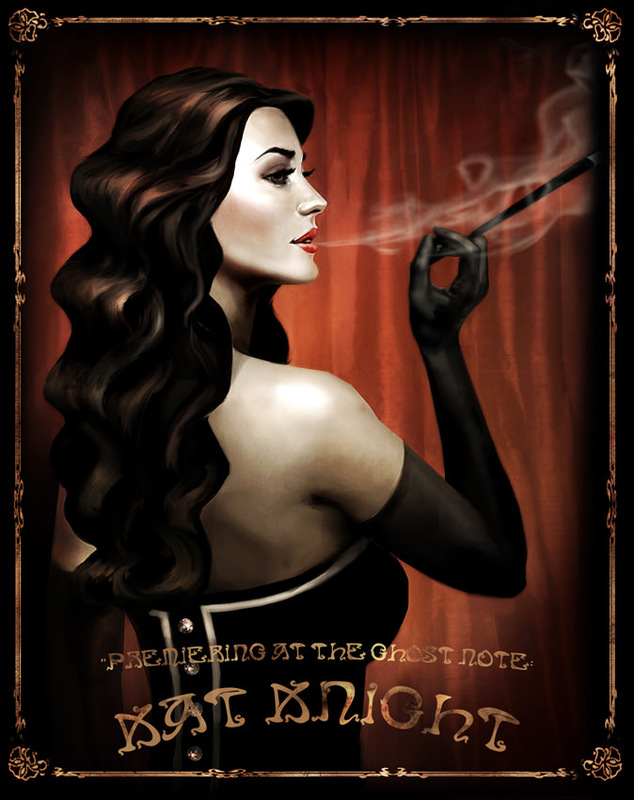 Kat’s Song (Kat is the cabaret-singer mother of the game’s main character) is a cool jazz tune that immediately brings to mind images of a cool 1920s evening with nightclubs advertising the best in entertainment on every corner and vintage cars rolling by on the streets. It sits somewhere between slow dancing with your dame and relaxing in a cushioned armchair slowly smoking a cigarette. House on Fire is the exact opposite. From the moment the song begins, the subtle piano and sensual vocals pave the way for the song to explode with energy only a few moments later. The song never slows down, becoming more and more energetic and fun as it progresses. The “House on Fire Scene” in the game itself is probably the most iconic thing to come out of the game, showcasing the shadowplay as well as the authentic atmosphere and environment, three things that set this game apart from others in its genre. Laura Ellis isn’t just the voice behind these songs, though. She’s a true-to-the-era performer in her own right, putting on shows that are as authentic as she can make them. Perhaps her most ambitious show is her “Femme Fatale”, a stage show that mixes vintage film footage with her own noir-style narration and classic singing voice. We were lucky enough to talk with Laura about her love for the 1920s era, her experience recording for Contrast, and her own unique performances. Check out the interview below, and we can almost guarantee that you’ll either be playing the game or purchasing her albums by the time you’re done. 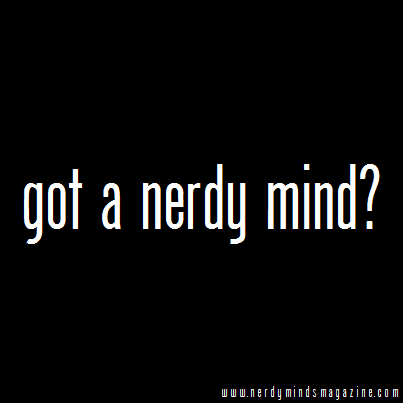 NERDY MINDS: Where did your love of music and singing come from, and why this particular style of music? LAURA ELLIS: My mother sang to me and my father had a great collection of 45s. We were always listening to music. I started out listening to 50s and 60s music and at some point started going back further. I fell in love with the rich melodies and complex orchestrations. And, of course, the fabulous vocalists of the era. NM: Who is your favorite artist, and what is your favorite/most inspiring song? LE: Woah! That’s tough, as it always depends on my mood. Some of my favorite vocalists are Sam Cooke, Otis Redding, Sarah Vaughn, Linda Ronstadt and Etta James. Some of my favorite songs are Someone To Watch Over Me, Bring It On Home To Me and Sunday Kind of Love. NM: How did you become associated with the game Contrast? LE: Guillaume called me out of the blue! They had been trying to license a Julie London song for the game trailer and found it difficult. I believe he found me on iTunes and thought one of my recordings would be perfect for the trailer. He described the game and it sounded amazing, so I was in! When they were ready to do the actual soundtrack, they asked if I’d like to be a part of it and I said YES! NM: What were some of the differences between performing in a venue and “performing” for the game? How did it compare with how you generally record your own albums? LE: Live performance is a one shot deal. It’s very intimate and also very immediate. This was totally different. It was a pretty fun process. Alex and Nic would send me a rough cut of the songs. Then, I would fool around with them and send back my interpretation. This would go on until they were satisfied about what would work best in the game. Then, Nic recorded the band in Canada and I recorded the vocals in LA. NM: How much information on the game were you given before you recorded the tracks for the game? Were you able to see any of the finished product before or during the recording process? LE: I got to see the famous club scene before we recorded. I was blown away! I couldn’t wait to be a part of it! NM: How did “Kat’s Song” and “House on Fire” come to be? Were there any other songs that were considered for use in the game that didn’t make the cut? LE: These were totally the creation of Nic and Alex. Nic did such a fabulous job on the entire soundtrack and Alex on the script. They worked their magic on these two to make them fit perfectly. I don’t believe there were any others considered. NM: Have you played the game? What did you think of the vintage world that the developers created and how your songs fit into it? LE: Yes! I found it gorgeous! So rich and beautiful on so many levels. I am so lucky to be a part of it! I’m very thankful! NM: What do you think of the CONTRAST soundtrack as a whole, your songs as well as the instrumental tracks? LE: Oh my goodness! That Nicolas Marquis is a genius! I love the whole thing! NM: Several sections of the game involve triggering flashbacks that play out in shadows on the wall, and you use them to reach new places. What did you think of these sections, and have you considered adding shadow tricks to your live show? LE: The shadow aspect is so cool! Hmmmm, I hadn’t thought of that, but I might have to consider it! NM: How was the overall experience working on Contrast? Would you perform the soundtrack for another game if asked? LE: Working on Contrast was a joy from start to finish! Everyone at Compulsion was wonderful to work with, especially Guillaume! Nic and Alex were so talented and giving as artists. I would do it again in a heartbeat. NM: Outside of the game, your performances carry an incredible level of authenticity. Do you have a favorite part of your shows outside of the singing itself? LE: Thank you! My favorite thing is connecting with the audience. Especially, since I perform music of the past, the songs can hold such memories for those listening. At a show recently, a woman told me that she kept forgetting to clap because she lost herself in her memories of hearing the songs for the first time. Best compliment I’ve received in a long time. NM: Do you ever get requests for “Kat’s Song” or “House on Fire”? Do you ever perform them? Where do they rank on your “favorite songs to perform” list? LE: So far, I’ve only performed House On Fire. It was very well-received. I love singing that song, there’s so much heat! Hopefully, we’ll get a chance to do Kat’s Song soon. I would LOVE to see more of a gaming presence at my shows!!! I’ve been thinking of doing a show of just game music. We’ll see…. NM: There are plenty of vintage-style jazz performers out there, but with acts like “Femme Fatale”, you really take things to a whole other level! What made you want to have such an extravagant stage show? LE: Ha! It was an undertaking, no doubt! Let’s face it, redheads who sing jazz are a dime a dozen. LOL. I wanted to create something truly unique. My husband, Luke Ellis is a television writer/producer (Nostradamus Effect, Modern Marvels, etc) and we never get to work together. So, it was fun to team up for this very unusual project. It is a blend of film and concert in the style of Film Noir. And, consists of music from those films. It was a true labor of love. I saw Gilda when I was 14 or so. I was mesmerized! That completely influenced me as a singer. Femme Fatale is my chance to be like Gilda for 75 minutes….I love it! NM: Where can our readers find your music? Is it only available digitally, or is there somewhere to buy physical CDs? LE: You can find me everywhere digitally (iTunes, Amazon, Etc). Physical copies on cdbaby. My first CD, Here Lies Love release in Japan. NM: Are you planning to perform live any time soon? If so, where? LE: I have a pretty busy season coming up. We’re in Kansas City this week with my 50s show, Kit and The Kats. We’ll be in Washington state, Florida, Northern and Southern California. If you’d like to see us come to your town, feel free to contact me via facebook or twitter with venue ideas. Please check us out at www.vintagevoicemusic.com for dates. As if that weren’t enough, she’s a little bit of a nerd too! 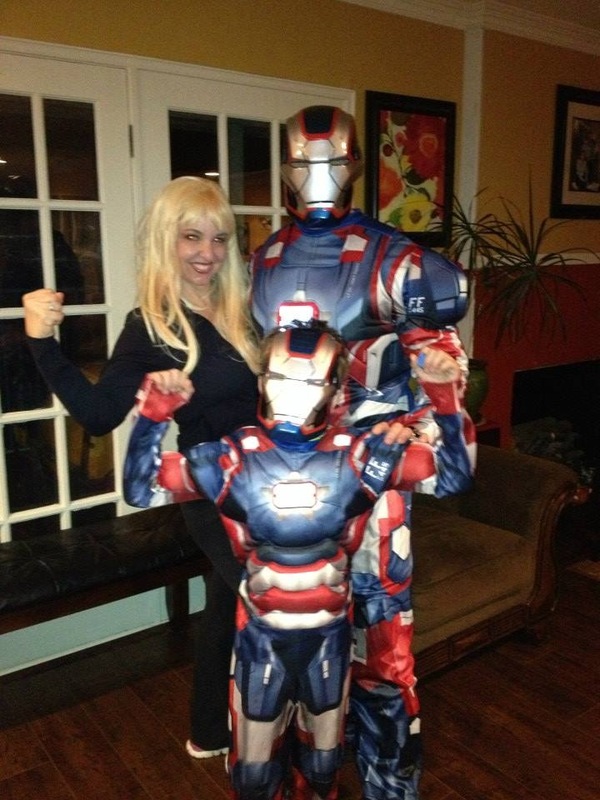 After reading a few of our posts on “geek parenting”, Laura proudly sent over an adorable picture of her own little geek family as Iron Patriot, Pepper Potts, and mini-Iron Patriot for Halloween. Maybe she could be on the next Iron Man soundtrack? CAPTAIN AMERICA: THE WINTER SOLDIER & AGENTS OF S.H.I.E.L.D. Midnight Release Party!